Salt Lake City is the cultural capital and headquarters for the Mormon community and a self-contained, rapidly growing, cosmopolitan but tradition-oriented city. Mormon settlers originally chose the location for its isolation and favorable agricultural resources. Today it serves as a major commercial and cultural center for the large intermountain U.S. west region, and is becoming increasingly popular as an alternative to crowded Pacific destinations. A favorable business climate has led to the development of a wide range of industries, from traditional manufactured goods to a growing base of new-economy products. The growth has attracted migrants from other places west (especially California) seeking less crowding, lower living cost, and employment opportunities in a pleasant climate. Proximity to outstanding outdoor recreation, including skiing, rafting, and hiking in the Wasatch Mountains, is almost without comparison among large metropolitan areas. By contrast, the desert areas to the west offer little recreation or economic interest. Downtown Salt Lake is beautiful, with boulevards originally designed by Mormons to be wide enough for wagons to make a U-turn. The city itself preserves a clean, dignified character enhanced by the capitol and government buildings and the various landmarks and sites of the Mormon Church. Extensive commercial and industrial areas spread south and west of I-15. Aside from Ogden to the north, most of the area’s growth has spread south along a 40-mile stretch of relatively flat valley ending at Provo. A string of attractive family-oriented suburbs starts about 5 miles south of downtown and east of I-15 against the mountains; Sandy and Draper are the largest. Because of limited geography and high growth, the city is experiencing some crowding, traffic congestion, smog, and a rise in the cost of living. But the economy is strong, there is plenty to do, the climate is generally pleasant, the population is educated, and good housing values can be found. The Mormon community maintains a strong influence on state government; conservative policies on alcohol and other matters are uncomfortable for some. Salt Lake City is located in a dramatic valley surrounded by high mountains on three sides and the Great Salt Lake to the northwest. The city center is flat but the Wasatch Mountains to the east have peaks to 12,000 feet. The dry Oquirrh Mountains to the southwest of the city have peaks to above 10,000 feet. Heavily influenced by the mountains and the Great Salt Lake, the climate is semiarid continental with four distinct seasons. Summers have hot, dry weather, but high temperatures are generally tolerable because of low humidity and cool nights. Winters are cold but usually not severe. Mountains to the north block some cold air and the salt lake moderates cold from the northwest. Average annual snowfall is under 60 inches at the airport but much higher in the mountains. Heavy fog can develop under temperature inversions in the winter and persist for several days. In summer, the mountain ranges help to develop thunderstorms, which drift over the valley, particularly the eastern portion. The lake and mountains together create summer breezes and more precipitation than would otherwise occur in this high-desert environment. Heavy precipitation comes from Pacific storms in spring. First freeze is mid-October, last is late April. The median home price in Kearns is $282,800. Browse Homes in this Range. 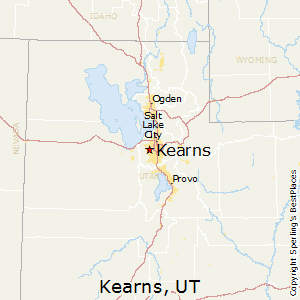 Compare Kearns, Utah to any other place in the USA.